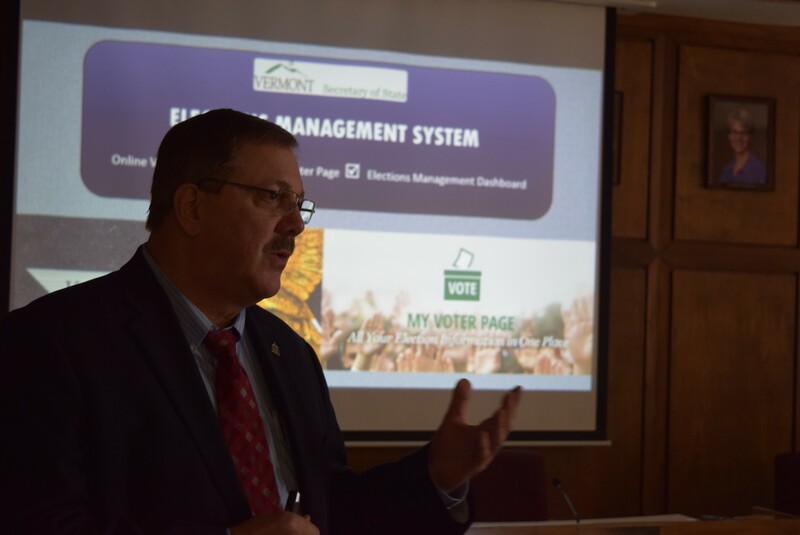 Secretary of State Jim Condos displays a new online voter-registration system Thursday at Montpelier City Hall. A warning to those who don't vote: You now have fewer excuses available. It just got easier to register to vote in Vermont, and easier to figure out where you’re supposed to vote and who the candidates are. Secretary of State Jim Condos unveiled a new online voter-registration site Thursday, which allows Vermonters to register to vote “while sitting around in your pajamas,” as one official put it. Condos said the new system "will make it easier than ever for all eligible Vermonters to participate in our elections.” Vermont is the 26th state to offer online registration. Vermont residents who are eligible to vote — U.S. citizens at least 18 years old — can also use the online system to submit a change of address or name change or to check whether and where they are already registered. Voters should find the online form more streamlined than the paper form the state uses, Condos said. The system also allows voters to make an online request for an early-voting ballot and to track that request. Along with being simpler and more useful for the public, the system should make it easier and cheaper for town clerks to maintain accurate, up-to-date voter checklists, Condos said. But does making it easier to register to vote mean more Vermonters will actually vote? There’s no guarantee of that. Online registration should help, but there are many other factors that influence voter turnout, said Dave Becker, elections director of the Pew Charitable Trust, which studies such issues. He said that how competitive the races are and the weather also play a role. An estimated 90 percent of Vermonters who are eligible to vote are registered, Condos said. But lots of those people don’t end up voting. In 2014, only 41.5 percent of the voting-age population did the patriotic deed, according to the Secretary of State’s Office. In 2012, the last presidential election year, the figure was a healthier 65 percent. Compared with other states, Vermont has nothing to brag about when it comes to voter turnout. The state ranked 25th — smack in the mediocre middle — in 2012, according to a Washington Post analysis. The listing showed Vermont’s ranking that year had slipped from 18th in 2008. Gov. Peter Shumlin argued that same-day voter registration, scheduled to start in Vermont in 2017, should increase voter participation. He and Condos said they also support automatic voter registration when people apply for or renew driver’s licenses. Condos said he’ll ask the legislature to consider that next year. California and Oregon have such systems, he said. The new online voter registration function is part of a $2.7 million computer upgrade the Secretary of State’s Office has rolled out during the last year. It includes online reporting for campaign finance and lobbyist disclosures and a statewide voter checklist. Federal money paid for $2 million of the cost, Condos said. The site also offers voters personalized information on a "My Voter Page," which tells them where their polling place is located, its hours and the candidates running in their specific election districts. Closer to the day of the election, a voter will easily be able to call up a sample ballot that looks just like the one he or she will see at the polls.